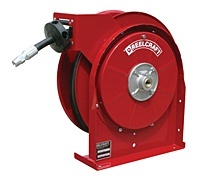 ReelCraft 5630 OMP Oil Hose Reel 3/8" I.D. 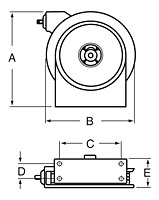 Series 5000 - 3/8� I.D. Series 5000 hose reels are durable and compact for a wide range of applications with critical space requirements. A full flow shaft and swivel assures maximum product delivery. The basic reel without hose can be used for air, water or oil. Medium pressure reels furnished standard with S.A.E. 100 R1T one wire braid hose.